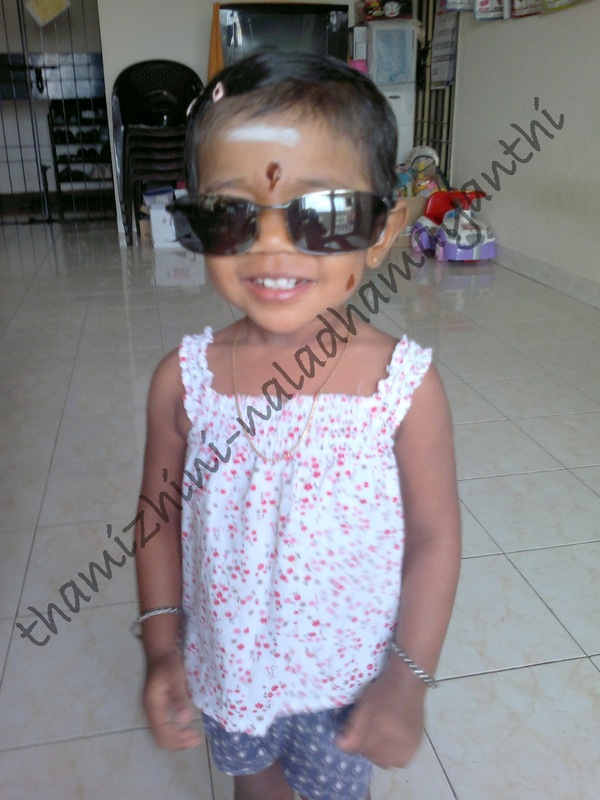 As you follow this blog, you must be knowing that Thamizhini started talking very nicely by seeing the last month's videos. I was complaining that after knowing few words like, "Don't touch, mma Please ma, Paapa Azhuva", she was not at all listening to our words. And as she speaks fluently, we are in trouble always. We can't simply escape by telling her something. Whatever it may be, playing with toys or eating fruits, she does it perfectly. She knows what she wants and asks us by saying the name and at least she uses three to four words to make a sentence and these days always with sentences. Even if she simply wants water to drink, she asks like " amma antha thanni venum" or "amma en water bottle enge". I just think of earlier days and sometimes I loose myself on those memories. I remember her telling "Thayi" for water. Now she is not only telling "Thanni", but makes full sentence and ask us. So tasty, it is watermelon! Also she helps a lot at home, if we want something and she will run and get it. If phone rings, she will run, if someone wants water, she will run and get it. If we say that we want water and we go to take ourself, she will start crying saying that she will only do. Lovely Darling! They are my friends....!!! I always be with them. 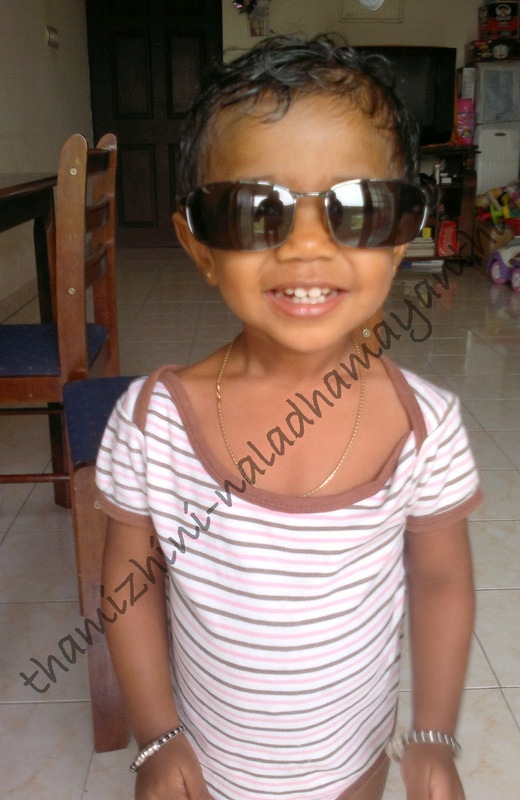 These days she is so much fond of wearing coolers. We have bought one for her size, but she never likes to wear that, but always runs to mine or her Daddy's. Check out the photo poses that she has given for us with goggles. Hey! How do I look? Check out her hair clips. It is not her interest, but mine. 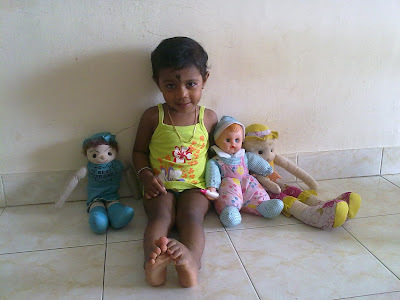 :P Sometimes she is like a baby doll, I love to dress her nicely, comb and clip her hair and of course she accepts it. 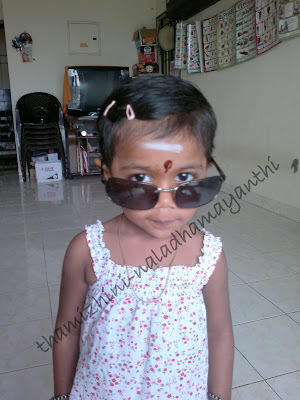 But many times she does not like :-( She neither likes Bindhi not clips. Ennapa photo edukareenga ivlo nerama?